Who loves learning new crochet techniques? I certainly do! And I love teaching new crochet techniques, too! 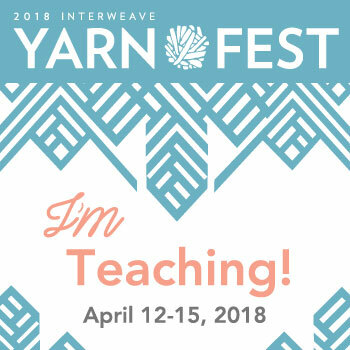 I’m super excited to announce that I’m teaching 6 crochet classes at the 2018 Interweave Yarn Fest in Loveland, Colorado from April 12-15! Woohoo!!! This will be my first time teaching there and I can’t wait to meet new crocheters, see crocheters who I already know, see the yarny goodness in the marketplace and have lots of fun! I learned this fascinating crochet technique over 10 years ago and I really enjoy it! The front and back of Intermeshing Crochet pieces usually look different because of how and where you make your stitches. It’s a really, really cool technique! 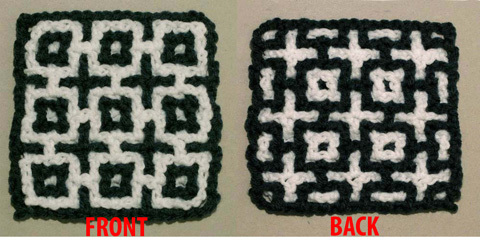 It’s the same technique as in the “Interlocking Crochet” book by Tanis Galik. If you’ve tried this technique on your own and you can’t understand it, I’d be happy to help you figure it out in this class! I’ve enjoyed the Bruges Lace crochet technique for many, many years! I LOVE anything lacy and this technique is lots of fun! It looks very much like the Bruges Bobbin Lace that’s so intricate and time-consuming. I just learned to do bobbin lace (2 weeks ago) and soon I’ll be able to do “real” Bruges Lace with bobbins instead of a crochet hook! But I still love to do Bruges Lace in crochet! This technique can be done with yarn instead of crochet thread for those who aren’t comfortable with smaller crochet hooks and crochet thread. 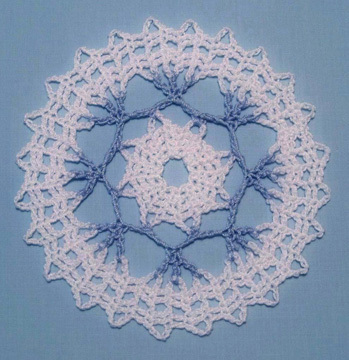 I’ve been crocheting doilies with crochet thread for decades now, some of them in Irish Crochet! While my good friend, Kathryn White, was working on her Irish Crochet book for Annie’s about 5 years ago, she taught me some more Irish Crochet (she’s an expert in Irish Crochet)! I’ll be sharing what I’ve learned with you in this class! I can’t remember how long ago I learned mosaic crochet. There are so many variations on how to work mosaic crochet. Each one has its strengths and weaknesses (like is it reversible, how many stitches can you work in a row, are they anchored, etc). I started working on a new crochet design a few weeks ago with some mosaic crochet in it and I enjoy this technique very much. I’m sure you will, too! I’ve done Filet Crochet for almost as long as I’ve been crocheting (over 40 years now)! I absolutely LOVE this crochet technique! 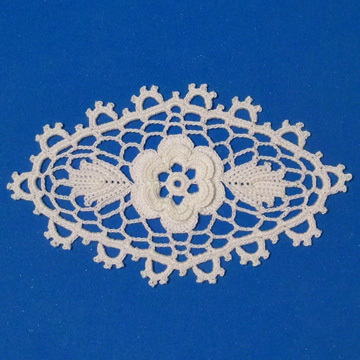 You don’t have to enjoy thread crochet to enjoy the Filet Crochet technique. I’ve made filet afghans, shawls and more with this technique (using yarn)! In this 6-hour class, I’ll teach you everything you need to know to be successful with basic filet crochet, as well as more advanced filet crochet (like increases, decreases, diagonals and lots more!). 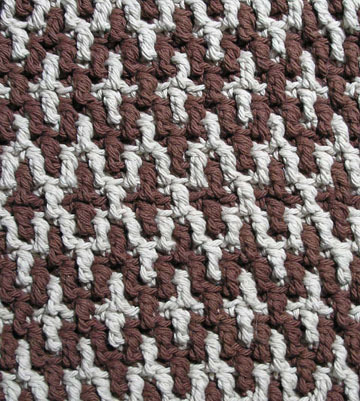 This is one of the slightly newer crochet techniques to me. It’s a lot of fun and I enjoy it, too! 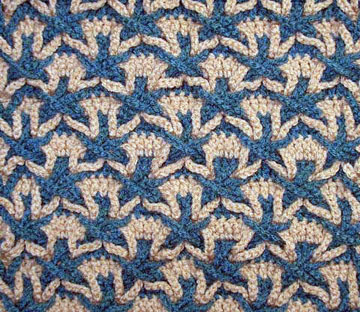 You work basic crochet stitches according to the pattern. Then you weave the loops to create the Polish Stars! It’s so much fun to see the stars take shape right before your eyes! If you’ve ever seen this technique and wanted to give it a try, I’d love to have you in this class! To read more about my classes and all the fabulous classes being offered this year, check out this link. 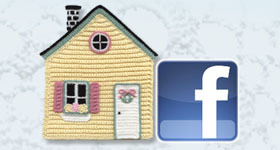 To read more about the Interweave Yarn Fest, check out this link. I hope to see many of my friends and meet new friends there! If you read this blog post and you sign up for some of my classes, please drop me a note and let me know! Or tell me in class! 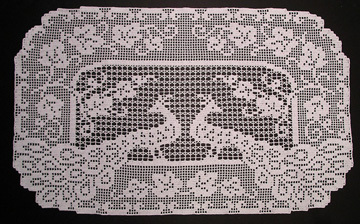 This entry was posted in Bruges Lace Crochet, Crochet technique, Filet Crochet, Irish crochet, Mosaic Crochet, Teaching classes, teaching crochet, Thread crochet and tagged Bruges Lace, classes, conference, crochet, crochet class, crochet techniques, Irish Crochet, Mosaic Crochet, teaching, thread crochet. Bookmark the permalink.